DON’T CHA’ KNOW WE’RE L’OAK-O!? IOB takes you south of the border as we throw our Fiesta L’OAK-O on May 5th and 6th. We’ve compiled quite a list of new offerings and tropical infusions for your weekend get-away. Your trip starts on Friday with the tapping of our new Mexican Lager “Imperial L’Oak-O”. We’ll also be tapping a strawberry daiquiri wit, Mexican spiced imperial milk stout, and a pina colada mai bock. That’ll be followed up at noon on Saturday with the bottle release and tapping of our tequila barrel aged “Dom Beersaison”, a 9% kettle soured saison. Bottles will be $15 (CASH ONLY) and the limit will be announced day of based on turn out. Pouring alongside it will be a mojito Mexican Lager, and a Hawaiian porter, Sunrise wit, and a margarita verison of the BA sour saison. 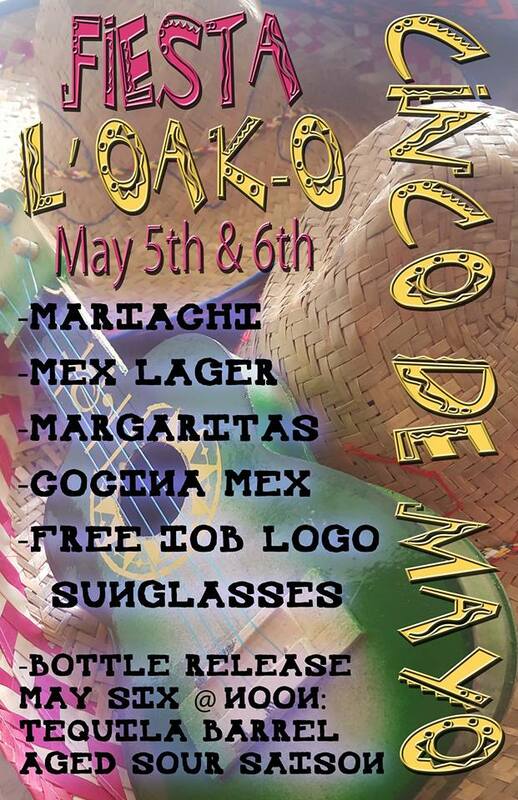 Enjoy some Mexican cuisine fromArnold’s Tacos on Friday, then Burger Antics and Ofrenda Food Truck on Saturday. The 8 piece Mariachi Show Sol De Oro kicks off at 1p on Saturday too. Oh, we’re also giving away IOB logo sunglasses both days too (supply limited). Come get L’Oak-O with us! Please note that some of the infusions will be poured at a CASH ONLY station. bottle release, Cinco de Mayo. Bookmark.